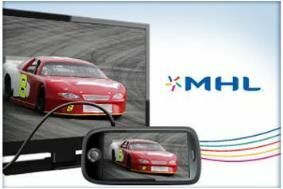 CES 2011: MHL promises powered link between mobiles and TV | What Hi-Fi? The Mobile HIgh-Definition Link (MHL) group envisages an array of devices - anything with a battery, really, from mobile phones and tablets to cameras, camcorders and even powered headphones - that you can plug into any TV with an HDMI socket, for the purposes of both charging and content-sharing. The devices will connect via a thin, easy-to-pocket cable with a micro USB connector - as already found on most mobile products - on one end, and an HDMI socket on the other. Although slim, the cable is capable of carrying Full HD (1080p) video and 7.1-channel HD Audio. The user can then browse the content of the portable device using the TV's remote control (plus additional, existing Bluetooth keyboards/mice as required) - all the while knowing that their mobile is recharging while tethered. The MHL group sees the technology having a wide range of uses, including enabling travellers to enjoy HD movie content in hotels without it being restricted to the small screen of their mobile or tablet on which that movie is stored. The first MHL-supporting devices are expected to be announced this Spring; Mobile World Congress was mentioned, so we'll assume they are mobile phones. While we wait for MHL-supporting TVs, the group expects these mobile devices to ship with a dongle that alllows you to connect simultaneously to both any TV's HDMI slot (for the content sharing) and your device's charger (to provide the power). Interesting stuff - we'll bring you more news on MHL products as they are announced.